It was in the planning (at least by Spocky!) for months, and finally the weekend was upon us. Bollards, Speedy, Rocky and I arrived mid-afternoon at Cross to recce our Sunday trail. Bollards had explicitly told me only to take one pair of trousers. Pity we choose to walk the trail in our non-hashing clothes ... never mind - muddy jeans for the rest of the weekend! Then a quick journey across to Charterhouse, where the beer was already tapped and things were already getting going. As the hashers gathered, the food mounted and the fun started. A great selection of food brought by one and all, and Strapo and Swampy did a great job of getting it ready. This week's words by Groucho! 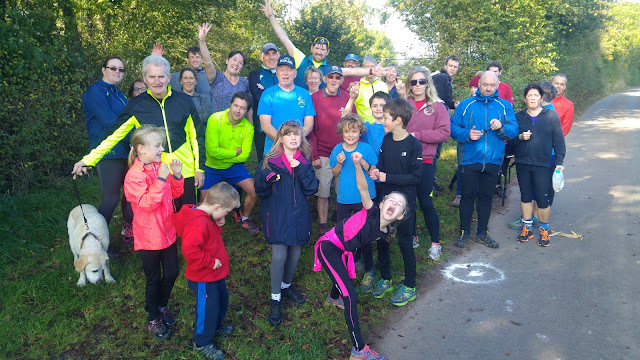 The road closures in and around Exeter due to the Great West Run didn’t hamper the journeys of those who made it to today’s hash, and with no late comers, it can be assumed that everyone who intended to be there, was. Janet made an interesting entrance to the car park; arriving off road across a field! 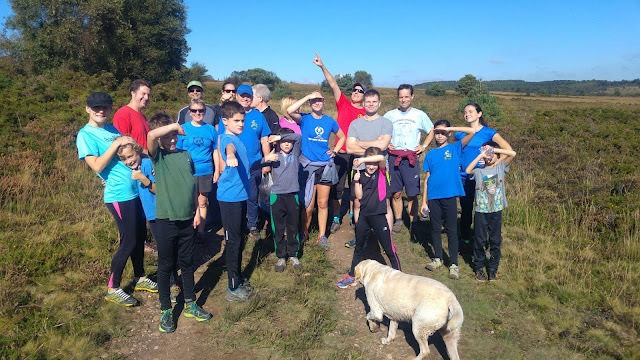 Its the Great West Run on Sunday, which might mean that you have to carefully plan your journey to the hash (Newton St Cyres Golf Club). Please find website address for Great West Run 2016 which shows road closure times and map of run route. 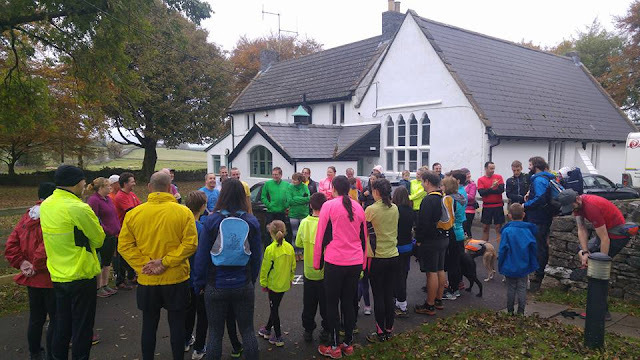 info@thegreatwestrun.co.uk or telephone 07500129604. It would appear that the route from Sainsburys Alphington via Cowick Lane,Buddle Lane, Exwick Road then St Andrews Road which joins the A377 at Cowley then as normal to golf course is due to be open to traffic from 10.30 hrs. I will for my part delay the start of hash until 11.15 hrs. This week's trail was a bit different. 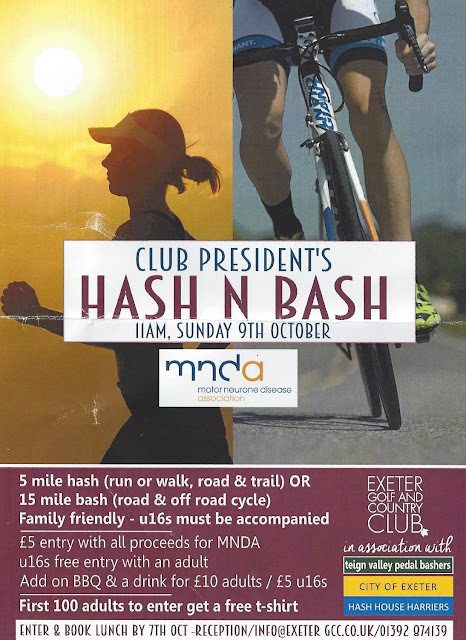 Blobby had organised a fundraiser in aid of MND at the golf club on Topsham Road. 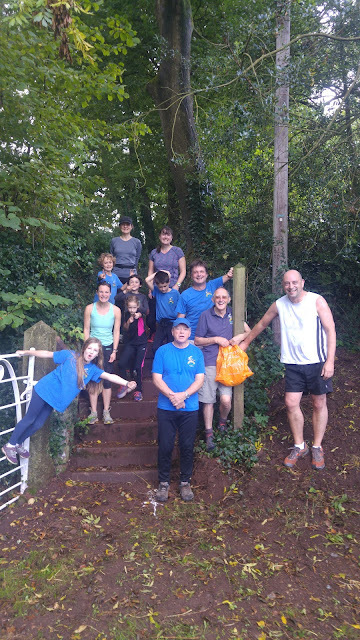 We had a good size pack of 30+, and Teign Valley Pedal Bashers joined in too for their own trail - apparently into the city and back via the Turk Locks. 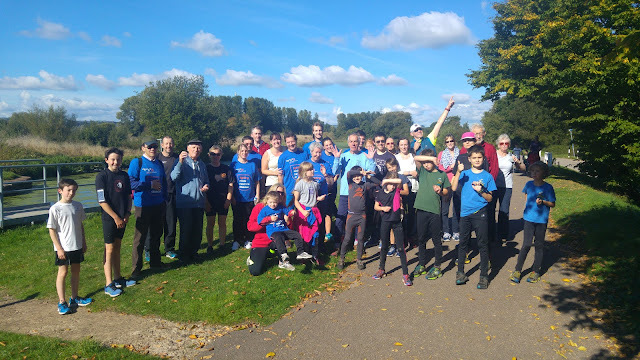 We all got a t-shirt for our £5 donation from some really happy MND volunteers (how mad are they to be that cheerful on a Sunday morning!). Blobby took the virgin hashers over to a dark corner - allegedly to show them his markings, and then after a few ramblings from Spocky - we were off. The hash circled up at 5 past 11, without the Hare, who apparently had “probably gone to get a coffee”. He eventually turned up at 10 past and was followed into the packed car park by several vehicles all containing well-dressed families, who proceeded to block us all in as they weren’t going to be there as long as we were. I’m not sure what they were doing, but I certainly wouldn’t wear clothes like that if I were walking on Woodbury Common.